to be permanently sidelined by back injuries. For nearly a decade, Woods has been sidelined by a string of back problems. Going back to 2010, when he had inflammation from a facet joint neck problem, to his bouts with pinched nerves in 2014 to 2015, and his struggles with back spasms in 2017, Tiger has had to deal with so many conditions that would severely restrict any normal person’s movements and day-to-day activity. For a professional golfer at the top of his game, having to deal with these restrictions in movement would be career-ending. After a series of withdrawals due to various knee, back, and neck injuries in 2011 to 2017, it looked very likely that his injuries had indeed ended his career. However, a fourth operation in April of 2017, an Anterior Lumbar Interbody Fusion (ALIF) on his lower back, seems to have saved him from permanent retirement. Statistics show that there are some 30,000 golf players (around 28%) who are suffering from some type of back pain. There are many top golfers aside from Tiger who have had similar struggles with spine problems including Rory McIlroy, Jason Day, and Fred Couples, just to name a few. The reason for this is that golf swings force the body, especially the spine, to undergo unnaturally violent swinging movements. These repeated movements, over the course of many hours and years of playing, cause injury to the discs and eventually present as persistent lower back problems. 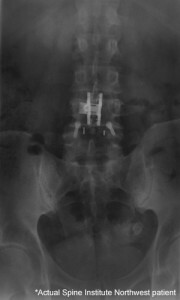 Luckily for Tiger, his lumbar fusion procedure did not involve an area that severely limited his movement. Of course there are compromises in any spinal surgical procedures, but because it involved the 1st vertebrae of the sacrum, which is the bone on the base of the spine between the two hip bones of the pelvis, possible future complications on any other lower discs. Also, the area of the spine involved is an area which moves the least, so mobility will not be noticeably restricted. While the procedure has improved Tiger’s game and brought him back to at least a more competitive level, he had to learn to adjust his swing to continue playing. Are you suffering from lower back pain or are suffering from complications of herniated or collapsed discs? To find out what options will be best for you, contact us at the Spine Institute Northwest for a consultation and begin getting your life back.